June - This month we abandoned our attempt to get Broadband because we just couldn't get a connection so we remain connected using dial-up. With Jane working late on 2 days a week and Steve working long days the evenings are times when we tend to slump asleep in front of the TV. This is obviously not good use of our lives but there doesn't seem to be any way out of this behaviour however we do make very good use of our weekends. We finalised our preparations for our Australia holiday later in the year; all internal flights are booked and accommodation in Melbourne has been paid for. Now all we have to do is turn up at the airport, sit in an aluminium metal tube for 30+ hours and enjoy three weeks of fun and excitement - can't wait. 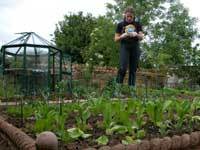 Jane made a late start with her vegetable plot but with Steve doing a lot of the digging and cultivating there was a good loam for her to plant the lettuce, beans and sweet corn that she had nurtured in the greenhouse. We've had some very hot days this month so Jane was busy watering every morning and every evening to stop the plants from dieing. The runner beans have gone in particularly late but with the kind of weather change we now experience we expect to have vegetables late into September. The pond is maturing but we have a serious problem with blanket weed that is clogging the whole pond. The frogs, newts and fish don't seem to mind because it gives plenty of cover from preying Herons. Jane went to the BBC Garden show at Birmingham NEC and managed to find a natural solution, extract of straw, which is supposed to control blanket weed without harming the rest of the flora and fauna. 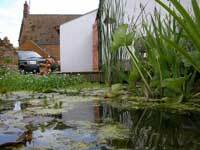 We'd heard that floating a straw bale in a pond helped to kill blanket weed so this extract has been developed to have the same effect. In previous months we've had problems with the stream leaking somewhere and the water in the level pond falls dramatically but we've found the cause of the problem and the stream is now running constantly without great loss of water - other than evaporation. Some heavy rain in the final week of the month helped to maintain water levels. As this photograph shows the dragonfly nymphs have been emerging. 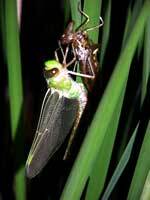 One evening we watch several nymphs climb out of the pond up a bulrush reed and start the long process of breaking out from the nymph stage into the fully grown dragonfly. This requires a level of acrobatics that appears to be very risky. The new creature slowly comes out backwards and upside down before it starts to get itself up the right way, clinging back on the shell of its former self. Having watched this on several evenings we got up early the next morning ready to photograph the creature with its wings outstretched and ready to fly. As with all things at this time of year when the sun rises around 4 o'clock we were too late - the dragonflies had spread their wings and flown. Our pond must have played host to at least ten emerging dragonflies but we haven't seen a single one return to lay eggs yet. 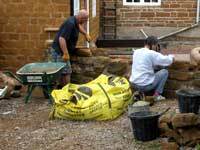 At long last the boundary wall between ourselves and next-door has been started. Mick, a local handyman, has been helping Jane - or is it the other way round? In just a few days the wall has made good progress and should be finished in the next few weeks. Mick is only available a few days a week because he has a number of other jobs around the village. Once the wall has been completed we can resurface the drive completely with fresh gravel as illustrated in last months edition. Another outcome from building the wall is the pile of stone that we had behind the house has been significantly depleted and we have an area that we can clean up and utilise, possibly extending the patio. The Nether Heyford archaeological dig has started and Jane has been weeding, digging and wheel barrowing most of the last week of the month. She took along a couple of people who had never been before, they both enjoyed themselves in different ways as one of them returned the day after all on her own. They needed the extra bodies as someone stupidly advertised the fact that Channel 4s Time Team were coming which means they have stacks of bodies next Wednesday and Thursday wanting their 5 minutes of fame. Up until the last day of the month they had not found much at all, it won't be a very interesting site for the TV if they don't discover an earth shattering find soon. Moan of the month - this month we had a run-in with Parcelforce, the parcel section of Royal Mail, who failed to deliver a parcel because it had excise duty to pay. Steve's brother very kindly sent us his "old" Nikon D100 digital SLR Camera. When we tried to contact Parcelforce to get them to re-deliver they were either constantly engaged or didn't answer the phone. This went on for two days and attempts to contact them via the web were next to useless because the delivery man had not left a parcel reference number. Eventually we contacted Customs and Excise who were extremely helpful, only required our name and address to locate the parcel reference; and gave clear advice should we wish to challenge the duty that was required. After an appalling customer service experience that included being passed several times between various call centres, Jane eventually managed to get the parcel delivered one week after the original attempt. Our advice is never use Parcelforce if you have a choice.